Dubai Ports World in the United Arab Emirates (UAE) paid $6.8 billion to purchase London-based Peninsular and Oriental Steam Navigation Company (P&O), which runs Baltimore's public terminals. P&O, the fourth-largest ports company in the world, would also take over significant operations at five other American ports, New York, New Jersey, New Orleans, Miami and Philadelphia, as part of the sale. The Bush administration considers the UAE an important ally in the fight against terrorism. 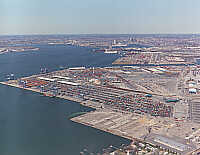 The company's P&O Ports unit employs about 65 in Baltimore and is responsible for many of the unionized longshoreman hours. 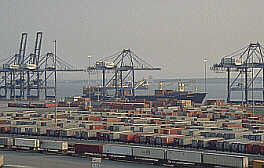 It predominantly handles containerized cargo for the state-owned port at Seagirt and Dundalk Marine terminals (pictured below). DP World won approval from the U.S. Committee on Foreign Investments, which includes representatives from the Departments of Treasury, Defense, Justice, Commerce, State and Homeland Security. The foreign investments panel considers security risks of foreign companies buying or investing in American industry. In January the White House appointed a senior DP World executive, David C. Sanborn of Virginia, to be the new administrator of the Maritime Administration of the Transportation Department. Sanborn worked as DP World's director of operations for Europe and Latin America. The security concern is that a port operator could manipulate manifests and other records to frustrate Homeland Security's limited scrutiny of shipping containers and slip contraband past U.S. Customs inspectors. AAEA supports the corporate sale because there are no negative environmental consequences and it appears to be a standard international deal with an American ally. Security concerns appear to have been adequately addressed by the appropriate federal agencies.